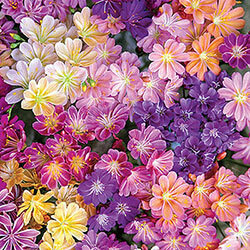 Say goodbye to finicky lewisia, this improved cultivar is much easier to grow. It tolerates heat a lot better, so it'll keep reblooming in spring and summer, possibly up to four times. The blooms practically glow with especially bright tropical hues. And they won't flop like traditional varieties can! The 6-8" stems are strong above hardy succulent foliage. The one thing this version absolutely needs is good drainage. Gardeners in dry locations will love how this brings vibrant color and life to their landscape. It'll perform beautifully in especially rocky soil, even in cracks in a rock wall. Of course, it still needs some water, but you should definitely not overwater, especially in winter. Foliage Type: Fleshy, flat rosettes of evergreen leaves. Flower Form: Rosettes of petite 1" funnel shaped or star shaped flowers. 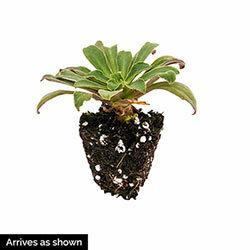 Planting Instructions: Requires sharp drainage, if water is able to sit in the crown, it will cause the plant to rot. Soil Requirements: Well drained, gritty or sandy soil. Winter Care: Avoid planting in an area where excessive winter moisture collects. Additional Information: Excellent drainage is a must. This plant would also be well suited for xeriscaping.